Prefab cabins are everywhere on the net, in all sorts of simple configurations, with the same inclusions and components as the larger kits. That is, they have floor systems, pre-made frames and trusses, cladding, insulation, windows and doors, all ready to slap together in a couple of weeks. Traditionally, log cabins are small, one-room houses built of logs notched at the ends, laid one upon another with the spaces filled with plaster, moss, mortar, mud, or dried manure. In North America they were built by early settlers, hunters, loggers, and other wilderness dwellers. They have also been built in Europe, particularly Scandinavia and designs vary, with common styles featuring sloping, single-gabled timbered roofs and small windows. Modern summer cottages may be built of logs or log-cabin siding to achieve a rustic effect. The modern version of a log cabin is the small log home, which is a house built from machine milled logs. There are many sites selling log cabin kit homes, which add an extra dimension to your project. Log cabin plans have an American wilderness style that combines pre-fabricated log cladding and exposed rafter interiors for aesthetic appeal. Cabin floorplans are be found on most kit home sites, and can be infinitely modified for a studio, extra bedroom with ensuite, tool/work shed, office, fishing/hunting shelter, beach hideaway, storage area, ‘eco’ cabin, park cabin and if you are an entrepreneur, a cosy bed and breakfast retreat. Cabin building is a cost effective kit home alternative to extensions to your home. Home extensions cost on average $1200-$1500 aud /sq metre for a builder to construct. You can buy a 3.6m sq cabin complete for $8-9000 aud + foundation costs and that’s a 60% saving to start with. Take into consideration the time it takes a builder to fit you into his schedule, the continuing inconvenience of laborers and equipment going in and out of your property, and the idea of building your own cabin starts to show its colors. Your plans, your schedule, your equipment, your result on your terms. Perhaps you might consider adapting a granny flat plan to your cabin idea? I have reviewed a few here. Two bedroom kit home plans are reviewed here. or go to our Yurt page. 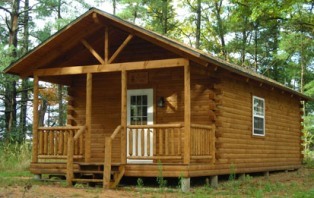 Here below are a few small cabin plans from around the web. Do you have a great story about cabin kit building? Share it!